Breakfast is the most important meal of the day. It provides fuel and gives you energy to tackle the busy day ahead. Eating breakfast improves your focus, clarity and attention span. It also improves memory and learning ability and can be an important weight-loss tool. 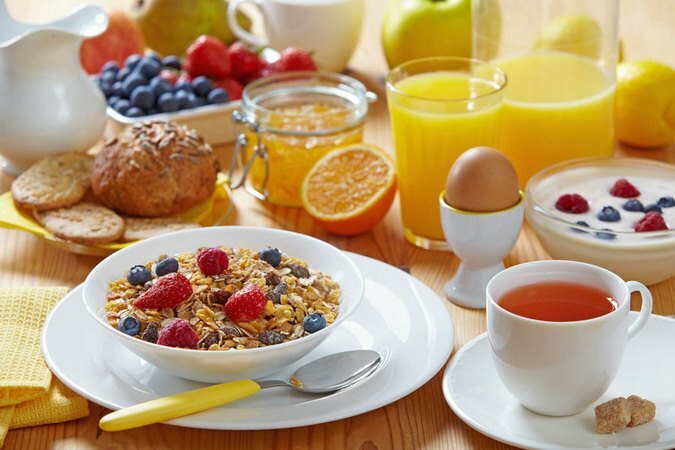 Eating breakfast can increase your metabolism and prevent binging later on in the day. The protein found in eggs can help you feel full until lunchtime and curb those cravings for unhealthy snacks! However, many people are still skipping breakfast, feeling that they just don’t have enough time to devote to the morning meal. But you can incorporate breakfast into your busy day! Even grabbing a piece of fruit or toast on the go, or some yogurt and granola, will help you to get the much-needed nutrition for your day. Why not incorporate breakfast into your workday? Meetings are not just for the office, or for lunch. Breakfast meetings before work, sometimes called “quick meetings,” have become increasingly popular, giving colleagues a chance to brainstorm and discuss ideas in a social and enjoyable setting before the day begins. Breakfast is also a wonderful family activity. On the weekends, going out for a hearty breakfast with family and friends is one of the best parts of a weekend—offering the opportunity to relax, reconnect and enjoy great food and create memories.